Ever wanted to get your favorite quote imprinted on a 3D object? Well we have an answer! Suitable to printing notes and signs like manufacture date, lot number and designs on various kinds of bottles, jugs, cups or boxes based on every type of material, Shri Vinayak Packaging Machine Pvt. Ltd, now offers you the PAD Printer. With a fast printing speed, this equipment is a top of the line product, beating it's competitors by huge margins. Highly efficient, this product is quality driven, thus being the top choice of various top companies today. Catering to the needs of majority of the market, our company will never compromise when it comes to quality. 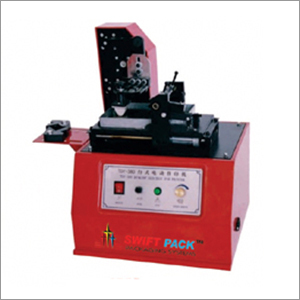 A high end precision product, the PAD printer machines are checked by our highly experienced workers who ensure that the machine is user friendly and gives the desired results.